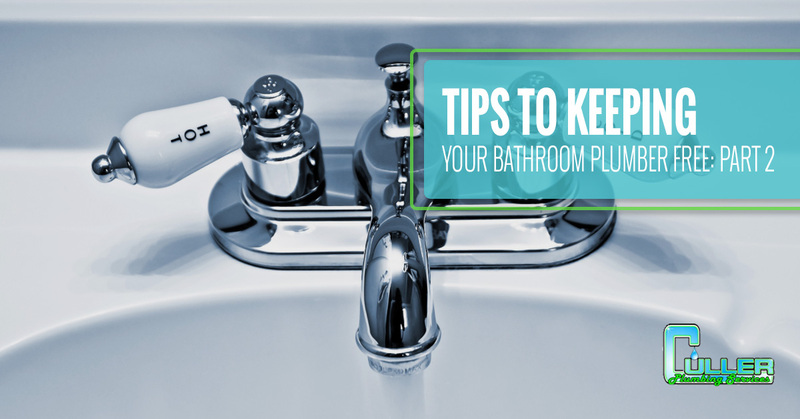 In part one of this two-part series, we began the discussion on how to care for and maintain your bathroom to help prevent clogs and leaks to keep it plumber-free. Here, we will continue with some more tips. The toilet is not a trash can. Septic and sewage systems, including the pipes that lead to the end, are meant for liquid waste. Solid waste will generally decompose in the sewer system, and what remains solid will sink as sludge. All natural human excrement and biodegradable toilet paper will not stay in septic tanks and sewer systems, the way other solid waste will. It is never okay to flush feminine hygiene products, hair, baby wipes, cotton balls, contraceptives, or any other rubbish down the toilet. Keep a plunger handy, ideally, right next to the toilet. Many people are embarrassed to admit they caused a clog in the toilet when their waste is a little too much to flush down. Many times, they will attempt to flush it down over and over again. which will not relieve the clog and may lead to a nasty backup and potential overflow. To prevent this, keep a plunger handy for use in these types of emergencies. Common places for toilets to leak are around the base and in the tank. If you have a constant leak or a puddle accumulating on the floor, be sure to have the leak fixed immediately to avoid water damage. Keep an eye on the pressure in your toilet. If your toilet bowl is (near) empty between flushes, or it takes more than one flush to swirl your toilet paper down, there is a water pressure issue. This can be caused by a few different things, but none of them are normal. 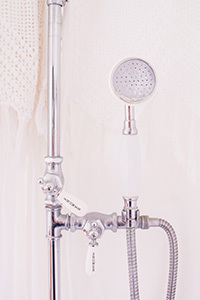 If the water pressure elsewhere — for example, the water pressure in your sink and tub — is fine, call a plumber right away. When you were a kid, your parents may have put a brick or something in the tank of the toilet to help reduce water usage and save on the water bill. However, any toilet made after the 1990s has a smaller, better-regulated tank, and your toilet needs all the water it holds to flush waste down. Resist the urge and do not place anything in the tank! Also remember, the tank is NOT a secret storage container; nothing should go into the tank. It could potentially block the flow of water, creating a big mess. Always keep a trashcan handy in the bathroom. It is recommended to have one per bathroom, and more than one if your toilet is separate from the rest of the bathroom. Always have a trash can available near the sink as well as the toilet. This will help prevent your toilet from being used to throw rubbish in. Even if you use baby wipes or bleach wipes to clean your bathroom, keep them under the bathroom sink rather than next to the toilet. This will discourage people from using the toilet to flush them after use. They should always be discarded in the trash can. Keep your bathroom stocked at all times. This should include a stash of rolls of toilet paper, bleach wipes, clean hand towels and washcloths, Kleenex, and soap. The bathroom is a dirty place, and when people are trapped, left to clean up a mess without any resources, they are forced to get inventive. When people are forced to find something to clean up with, it usually is flushed down the toilet. Don’t let your family — and your toilet — fall victim; keep your bathroom well stocked and user-friendly. 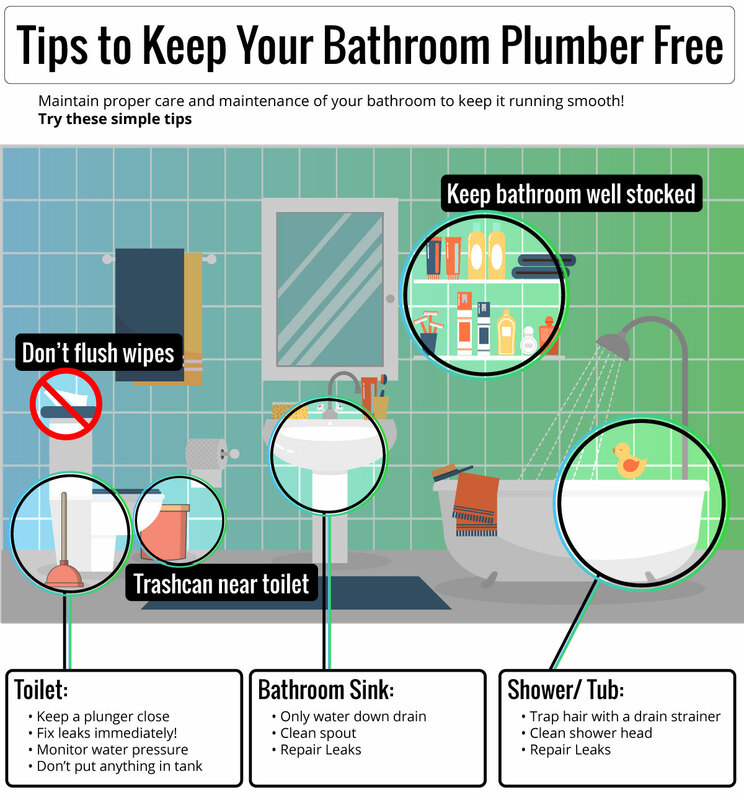 We hope that these tips have helped you identify some areas of improvement for your bathroom to help you prevent clogs and leaks. If you do have a clog or leak, or you have questions about routine plumbing maintenance, give our Belleville plumbers a call at Culler Plumbing Services today!